Change your name by deed poll. This deed of change of name is a declaration that you renounce your old name and that you wish to be known by your new name. It is a straightforward document to complete yourself and once completed, is sufficient evidence to provide to the UK Identity & Passport Service (the passport office), the DVLA, your bank and all other organisations that you have changed your name. If you are a British citizen and over 16 years of age, completing a deed of change of name (commonly known simply as a deed poll) is usually the easiest way to start the process of changing your name on all your documents and records. The law recognises the name that you use on the majority of records, not the name on any one single document. So to change your name legally, you not only need to complete a statement that you renounce your old name and take a new one (a deed of change of name) but you also have to tell friends and family to use your new name, and you have to tell organisations such as government departments, your bank and utility companies to do so as well. Government organisations, who should be the first organisations to approach (since the most important documents such as your passport are issued by government organisations), accept a deed of change of name as evidence of your intention to be known by a new name. There are many companies on the Internet charging high prices for what is in effect a printing service. We want you to know that there are alternatives to using these companies. A deed of change of name is a legal document, not a government form. There are no 'official' services approved by the government or run by a government department because changing your name is not a government matter. Nor is there any requirement to have your deed poll printed on special paper or stamped with a red, silver or gold seal. The document may look more 'official' or 'authentic' but the weight and colour of the paper and presence of a stamp have absolutely no legal effect. 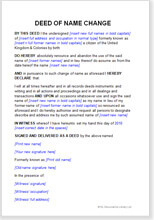 The UK IPS, the DVLA and all other organisations will accept a deed poll printed by you at home on normal white paper. If you haven't already, we recommend that you read our articles on changing your name for more information. "Simple to use, no silly file format issues that plague the US sites. Well done."